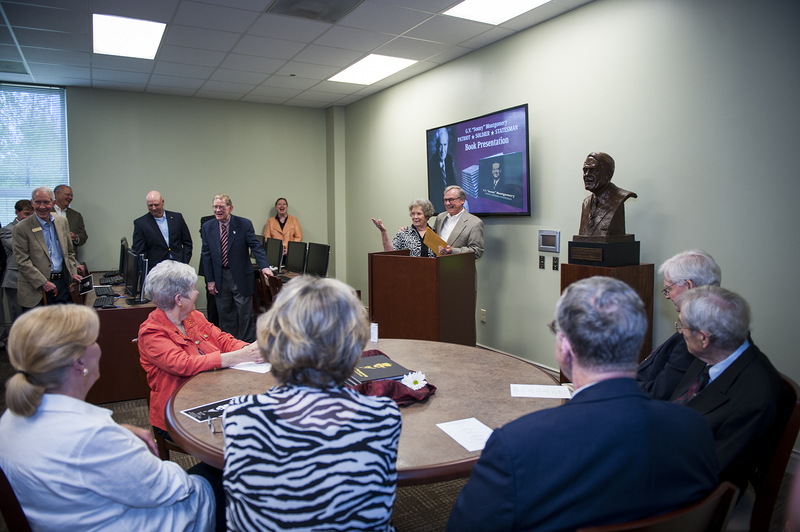 Mississippi State Libraries officials gathered with Montgomery Foundation representatives at MSU-Meridian on Friday to celebrate the release of the "G.V. 'Sonny' Montgomery: Patriot, Soldier, Statesman" pictorial book. At the podium, MSU Dean of Libraries Frances Coleman and Montgomery Foundation President Emeritus Bob Bailey unveil the book. MERIDIAN, Miss.--A new book honoring the life and work of the late U.S. Rep. Gillespie V. "Sonny" Montgomery was unveiled today on the Meridian campus of Mississippi State University. Montgomery died in 2006 at the age of 85. A book presentation ceremony and reception were held today [Friday, May 9] at the Phil Hardin Foundation Library on the MSU-Meridian campus. Taking part in the event were Montgomery Foundation leaders Bo Maske and Bob Bailey, MSU Libraries Dean Frances Coleman, MSU Chief Communications Officer Sid Salter, and MSU-Meridian Division Head of Education Julia Porter. The 156-page book was published by Pediment Publishing in Battle Ground, Wash. The book contains some 350 color and black-and-white photographs from the "G. V. 'Sonny' Montgomery Collection" at MSU's Mitchell Memorial Library. The collection contains over 13,500 photographs from Montgomery's public career. "Today represents the culmination of a long and productive effort to chronicle the life and work of a true American hero and one who served his state and nation in every possible way," said Coleman. "The contributions of Congressman Montgomery and the Montgomery Foundation to the MSU Libraries and to the alma mater he loved have been incalculable." Commissioned by the Montgomery Foundation and produced from the "Sonny Montgomery Collection" by the MSU Libraries. The book will be donated by the Montgomery Foundation to National Guard armories and facilities, schools and institutions of higher learning, and other appropriate venues as a testament to Montgomery's remarkable legacy. The Montgomery Foundation was established more than a decade ago through the foresight of the former congressman, its benefactor. Montgomery's intention was to provide a vehicle to which the bulk of his estate would be left and be used, after his death, to support and encourage his greatest interests. Montgomery retired in 1996 from a 41-year public service career that also included a decade in the Mississippi Senate. Following his election to the U. S. House of Representatives in 1966, Montgomery held the 3rd Congressional District office through the terms of seven presidents. He won national acclaim for leadership in passing the Montgomery G.I. Bill. It also helped cement his honorary Capitol Hill title of "Mr. Veteran." Montgomery devoted three decades of his life to military service that included active duty in World War II and the Korean War. He retired from the Mississippi Army National Guard with the rank of major general. In 2005, former President George W. Bush awarded Montgomery the Presidential Medal of Freedom, the nation's highest civilian honor. For more information on the Montgomery Foundation, visit www.sonnymontgomery.org. For more information on Mississippi State University, visit www.msstate.edu.